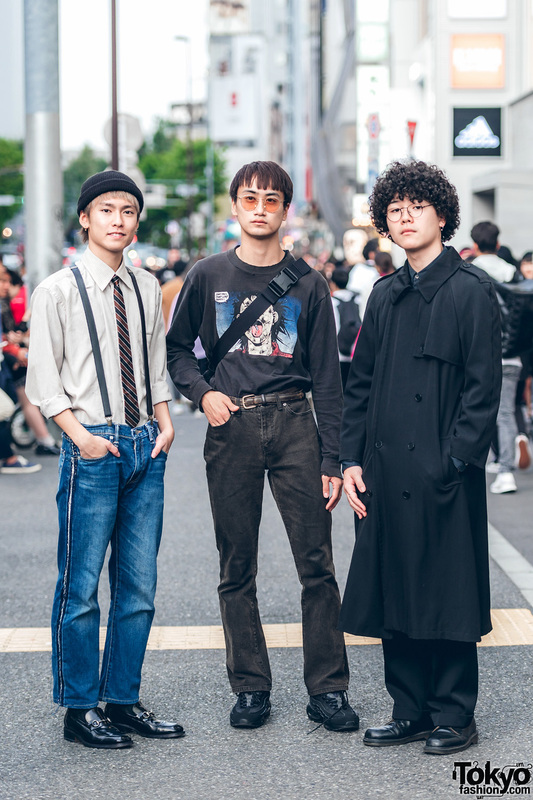 We spotted Naoya, Taiki, and Yohta while out and about on the streets of Harajuku. 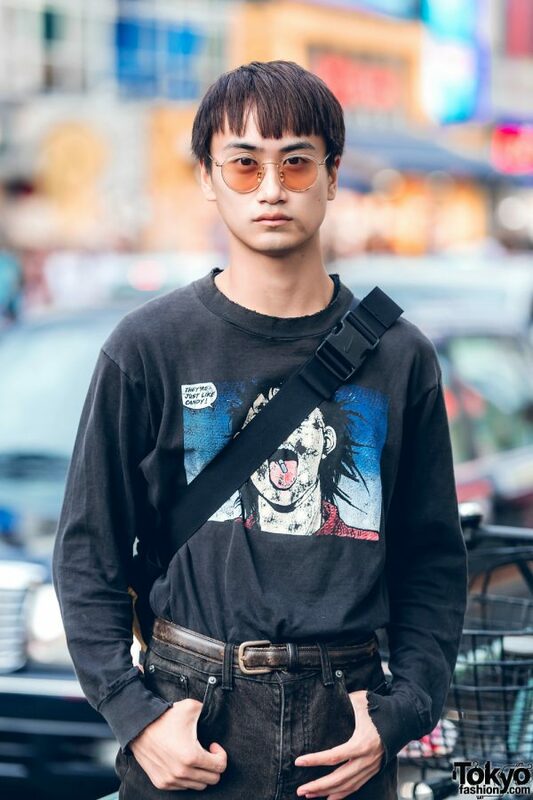 These 20-year-old students are often featured on our street snaps. 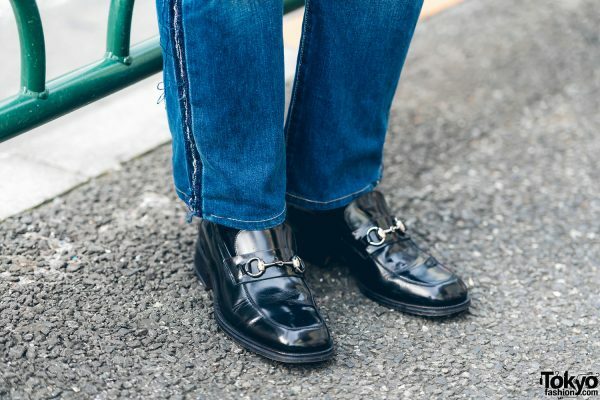 At the left is Naoya, who is wearing a vintage pinstripe button down shirt tucked into SebasTian denim pants with distressed side stripes, and Gucci leather loafers. 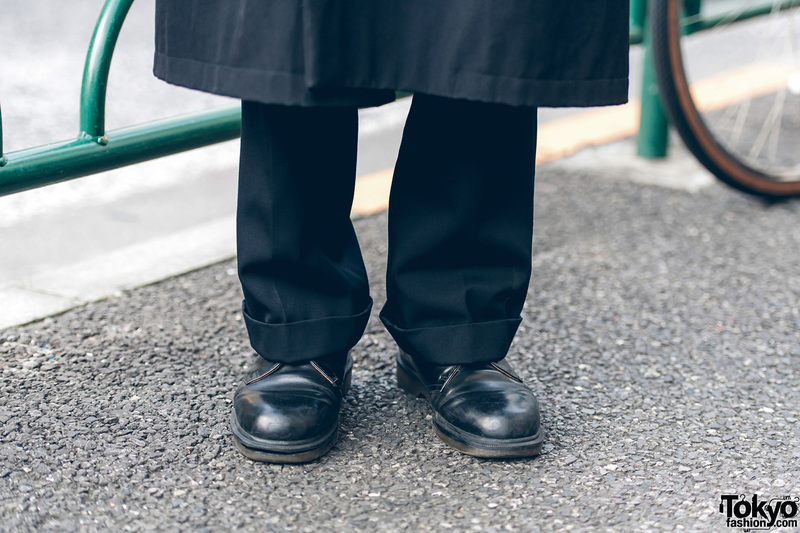 For his accessories, Naoya wore a black ribbed beanie, a diagonal striped necktie, and black suspenders. According to Naoya, his favorite brand is Gucci. Follow him on Twitter and Instagram for his updates. Taiki – at the middle – is dressed in an Akira black sweatshirt with distressed collar and cuffs, vintage black denim pants, and black Nike sneakers. 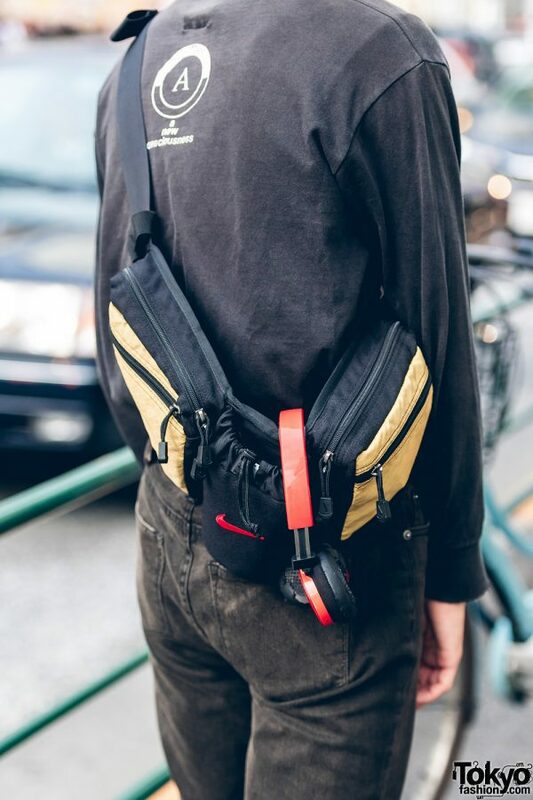 He is carrying a Nike two-tone belt bag slung over one shoulder, wearing brown tinted round sunglasses, and a vintage leather belt. 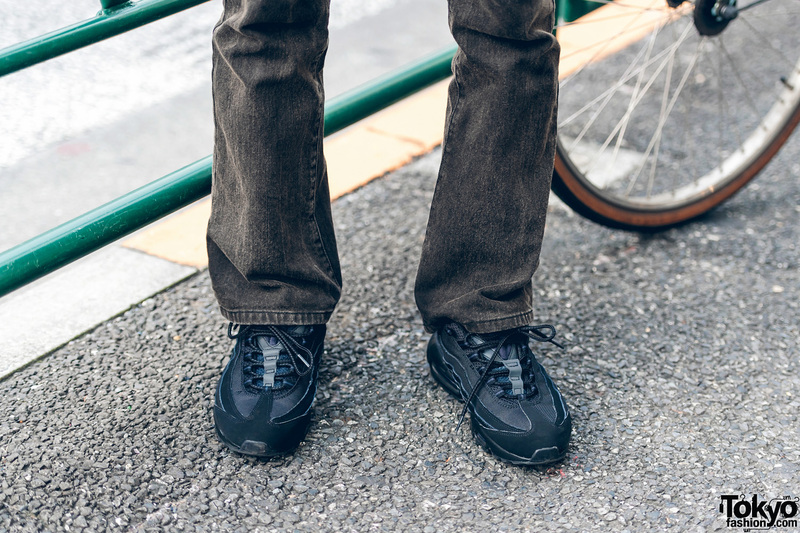 Taiki’s favorite brand is Vans and he likes the music of Silent Siren. For his social media updates, check Taiki out on Instagram or Twitter. 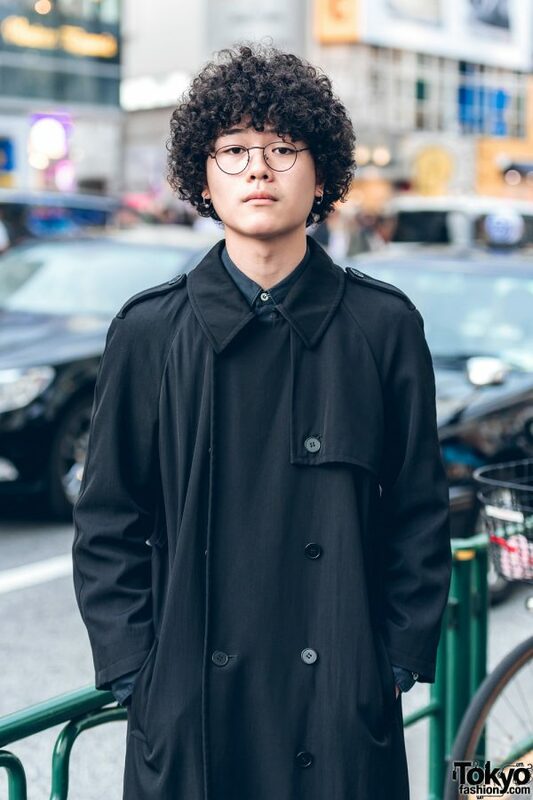 Lastly, curly-haired Yohta is sporting an all black look, which features a long coat from Calvin Klein, which he wore over a Comme des Garcons long sleeve shirt, black pants cuffed at the hem, and low cut boots from Dr. Martens. He accessorized with round eyeglasses and silver hoop earrings. Yohta enjoys the music of Australian alternative rock band, MGF. Follow Yohta on Instagram.